Just in time for bushfire season, Whispir creates a state-wide emergency warning system with unprecedented reach. Bushfire season in Western Australia is a high-pressure, high-risk time for both residents and for the state’s Department of Fire & Emergency Services (DFES). But with Whispir’s newly deployed emergency warning system, future fire seasons should carry less risk to human life. Prior to the government-commissioned Keelty Review, Western Australians had no centralised source of information regarding natural disasters. While the Department of Fire & Emergency Services had an overarching responsibility to supply the public with crisis information, different agencies operating within this body published their own information to different sources. As a result, residents had to hunt around for the information that was relevant to them – a time-consuming process with potentially life-threating consequences. After the 2011 Perth Hills bushfires, which claimed five lives, the Western Australian Government ordered a Royal Commission to determine how similar devastating outcomes could be avoided in future. One of the legislative requirements that emerged as a result of the Keelty Report was for DFES to adopt a specific location where all information could be published. Earlier this year, after a comprehensive investigation DFES selected the Whispir platform to build this information and public safety solution. Launched for the “Are You Ready” bushfire readiness season campaign, DFES has now officially deployed the centralised early warning system created by Whispir. 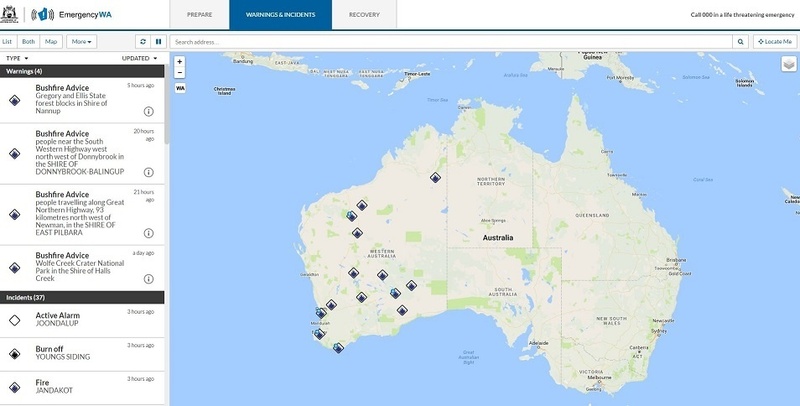 For the first time, all disaster information coming through DFES’ agencies will be published to a single location, where residents can go to find alerts for their location – regardless of where they are in the state, or what type of situation threatens. From this single source, information will then be fed through broadcast channels, social media, ABC local radio and DFES websites. For residents without an internet connection, this is crucial. With this new multi-channel approach, DFES will be able to reach more people than ever before. While Western Australia’s emergency warning system resembles the ‘One Source One Message’ (OSOM) solution that Whispir built several years ago for the Victorian Government, the solution created for DFES utilizes the latest technology and is specifically primed to Western Australian conditions. DFES worked closely with Whispir to pick the most relevant components of the communications platform, which Whispir then optimised to provide the high-level of automation required by the Western Australian government. Before Whispir’s solution, all emergency notifications in Western Australia were filled out manually by DFES, and distributed in a largely ad hoc manner. Now, real-time data on storms, tsunamis, bushfires, floods and other potential disasters will be automatically fed into the website from a range of reliable sources. The Whispir-powered website represents a single, trustworthy source of truth for Western Australian residents, and a more streamlined process for the Western Australian government. With real-time information easily accessible, more people than ever can take the actions they need to stay safe. For more information on communications for local government, click here.